The Drinks blog on Syracuse.com recently announced Southern Tier’s new Imperial Cherry Saison, a seasonal offering. Cherry flavored beers have never been a big hit with me, especially when the word “cherry” is part of the beer’s name. But, Southern Tier makes some great beer (just finished a sixpack of the IPA, top-notch) and I consider myself open to trying new things. Perhaps it was the Samuel Adams Cherry Wheat that put me off the cherry flavor, but that’s another story. 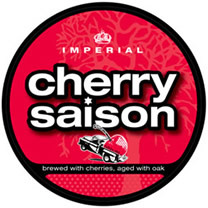 The Imperial Cherry Saison is 10% abv, so you might want to sip. ← June 1st may be beginning of the end for Cooperstown Brewing Co. I hereby pronounce a ban on fruit in beers.